Tangerine essential oil belongs to the citrus essential oil family, which is extracted from the peel of tangerines. Tangerines are citrus fruits that belong to the Rutaceae family, having a tangy taste and soothing flavor. Tangerines are smaller and less rounded as compared to common oranges. According to data from Food & Agricultural Organization of the United Nations (FAO), Mainland China is the largest producer of tangerines in the world, and exports approximately 25 to 30% of its production. Tangerine essential oil is widely used to combat stress-related insomnia and flatulence, and helps assist the better functioning of the nervous system. In addition, tangerine essential oil is antispasmodic, and also helpful for digestion and skin-related problems. In the food and beverage industry, tangerine essential oil is most commonly used in orange juices to impart a tangy and sweet flavor to the orange juice. Tangerine essential oil is also used in cosmetics, home scents, and aromatherapy and pharmaceutical products to add a vibrant aroma, which makes the surrounding air fresh and pleasant. Increasing health consciousness among the population is pushing up the demand for naturally-sourced essential oils, and there is increasing inclination towards aromatherapy. These are the major factors that are driving the growth of the tangerine essential oil market. The increasing demand for flavorful beverages is also boosting the demand for tangerine essential oil in the global essential oil market. The increasing demand for natural food additives in food products has also been contributing to the growth of tangerine essential oil market over the past few years. Manufacturers are considering tangerine essential oil due to its tangy and sweet flavor, which enhances the overall palatability of food and beverage products. Tangerine essential oil is mainly used in beverages such as fruit juices and flavored shakes where it is added in very precise quantity to bring a tangy flavor to the end product. In the global tangerine essential oil market, Europe and North America hold major shares in the production and consumption of tangerine essential oil, owing to the presence of global players in their food and beverage sectors. With the increasing demand for tangerine essential oil, it can be anticipated that, the overall demand of tangerine essential oil will increase over the forecast period. As much beneficial tangerine essential oil is for health, it can have medicinal and therapeutic effects on the skin as well as on the immune system too. As tangerine essential oil can be helpful in treating various skin and nerve disorders, it is used in various skin treatments and beauty products. Getting rid of pimples and acne, reducing blemishes, treating dry skin problems, etc., are some of the skin-related issues that can be cured with the help of tangerine essential oil. In addition, tangerine essential oil is a rich source of antioxidants, which are found to be helpful in anti-aging of the skin. An increasing number of health-conscious consumers across the globe is encouraging manufacturers to supply products with organic and natural ingredients such as tangerine essential oil. Consumers are preferring natural products instead of chemical products when it comes to buying beauty products. The use of tangerine essential oil in most beauty treatments is one of the most popular trends at present. Mass production and economies of scale have enabled fragrance companies in keeping operational costs low. However, consumers today prefer personalization and customization. Perfumes that are personalized and customized have a higher chance of hitting the right note among consumers, even in the absence of mammoth marketing budgets. In an effort to cater to the demand for pleasant citrus scents, manufacturers are considering tangerine essential oil for use in their final products. Higher engagement of customers, coupled with their patience with regards to product delivery, is encouraging manufacturers to instate a separate unit for considering customer needs. Product customization is also boosting perfume sales. The increasing demand for scented products for homes is fueling the demand for tangerine essential oil in the market. Products include scented candles and automatic sprays, plug-in scented oils, wax melts, and room sprays. The rising demand for interior fragrances is the key factor that is driving the growth of the fragrance market. According to data from the NDP Group, candle sales have increased by 16% with the use of essential oil in the candles. On the other hand, ancillary gift sales have increased by 75% with the use of fragrances in products. In addition, the demand for tangerine essential oil in fragrance is also increasing, due to advancements in technologies. With increasing disposable income, people are opting for a more luxurious life. Recent technological advancements allow people to turn on an electronic fragrance diffuser at home with the help of an application, even before coming home, so that their home smells pleasant on arrival. The present study exhibits the trends and market dynamics of the tangerine essential oil market in five major regions - North America, Latin America, Europe, Asia Pacific, and the Middle East and Africa. The report also includes the study of the current issues with consumers and various future opportunities for the tangerine essential oil market. The report explores the global tangerine essential oil market for the period 2018–2027. The primary objective of the report is to provide insights into the key developments in the market that are consistently supporting the transformation of global businesses that are associated with tangerine essential oil. It is very important to consider that, in an ever-wavering economy, we provide the estimated (Y-o-Y) year-on-year growth rate in addition to the compound annual growth rate (CAGR) for the overall forecast, to better understand the analysis and evaluation of the global tangerine essential oil market, and to discover equitable opportunities. Yet another key feature of this report is that, the estimation of the global tangerine essential oil market and the corresponding revenue forecast are carried out in terms of absolute dollar opportunity. This is usually not prioritized while forecasting overall market numbers. Absolute dollar opportunity analysis is very essential in evaluating the degree of opportunity that a provider can observe to execute, as well as to contrast the potential resources from a sales perspective in the global tangerine essential oil market. The report starts with an elaborate executive summary, the market definition of various segmentations that are included, and their respective shares in the global tangerine essential oil market. The report further incorporates the major macroeconomic factors that have an effect on the growth of the tangerine essential oil market. The report also highlights various market dynamics, which includes the drivers, restraints, opportunities, and trends in the global tangerine essential oil market. The report further underlines the study of the present issues with industrial processing and opportunities for the growth of the tangerine essential oil market. 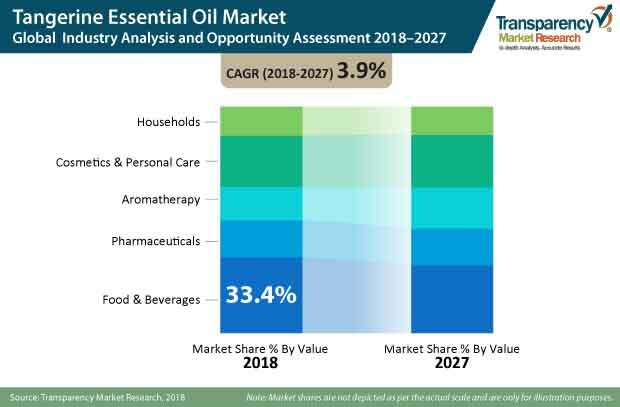 It also encompasses a value chain analysis that provides a structural view of overall profitability from the manufacturers to the end users in the tangerine essential oil market. It also comprises detailed information about the recent technologies that are used for processing to make high quality tangerine essential oil. In order to provide users with a clear view of the global tangerine essential oil market, we have exhibited a competitive analysis of key market players and their strategic expansions. The competitive dashboard presents a detailed comparison of manufacturers on valuable parameters such as key product offerings, total revenue, key developments, and key strategies. The study intensifies the global tangerine essential oil market attractiveness analysis by nature, grade, end user, distribution channel, and region. To provide deep-dive information about the global tangerine essential oil market, the report also provides a trade analysis. The report comprises the top five major regions that have a major share in the production and consumption of tangerine essential oil. In addition, the report also enlists major exporters and importers to obtain deep insights about the demand and supply of tangerine essential oil across the world. To evaluate the overall market size of tangerine essential oil, the report considers various fundamental aspects based on secondary research. Furthermore, it emphasizes quantitative evaluation such as market shares by nature, grade, end user, distribution channel, region, and other qualitative data from primary respondents, which have been consolidated to arrive at clear and accurate market estimations. The forecast presented in the tangerine essential oil market report arrives at the total revenue being generated, and the expected revenue contribution in the future by the global tangerine essential oil market.